Today we’re going to show a softer more sensitive side. Usually we’re pretty tough around here. We normally talk about projects like the awesome art of Derek Hess and printing apparel for The Black Dahlia Murder. But, today we’re pretty excited to talk about Lil’ Bub. When we first came across this sticker while looking through our samples, we found it to be equal parts hilarious and cute. So we did a little more digging, and much to our surprise, found out that not only is there an entire blog about the life of Lil’ Bub, but apparently it’s already very popular online. President & CEO Vera Stewart started Very Vera in her kitchen in 1984. She would bake cakes for her friends and family and quickly started filling mail orders. From there her business continued to grow, exploded in the 90’s and has continued to attract national attention from the likes of Oprah and The Food Network. Through Very Vera, you can order her famous cakes as well as gourmet food to be delivered right to your front door. It’s pretty awesome. The attention to detail she’s known for with the presentation of her food, definitely carries over to their print collateral. Our mouths were already watering when we saw some of the great designs that Very Vera was printing with us. In fact we thought the postcards they printed (designed by Leonard Zimmerman Jr.) were so good that we pulled them out of the stack and showcased them on the Jakprints Tumblr. When a Strawberry Lemonade cake and a Carrot Cake showed up at Jakprints, compliments of Very Vera, the mouth watering continued. Needless to say they tasted incredible. Thanks Vera! Tunecore and Jakprints are kindred spirits in a way. Both companies grew from the needs of the independent music scene, and CEO Jeff Price has been a client and friend to Jakprints for many years now. That’s why we couldn’t be happier when we saw the New York Times profile on Tunecore earlier this week! If you’re unfamiliar, Tunecore is a digital music distributor. Musicians, bands and indie labels can skip the step of going through traditional distribution middlemen and use Tunecore to get their music onto iTunes, Amazon, Spotify and many more online platforms for a flat fee of $50. Since it’s inception, Tunecore has generated over $300 Million in royalties for it’s artists. Jeff, an avid blogger and speaker, uses these avenues of communication to bluntly speak his mind about the hellish ins and outs of the traditional music industry. With blog titles like Why Everyone But The Artist And The Music Fan Is Doomed and How They Legally Steal Your Money, along with aggressive criticisms of Grooveshark and the industry in general, Jeff definitely fights for the little guy. 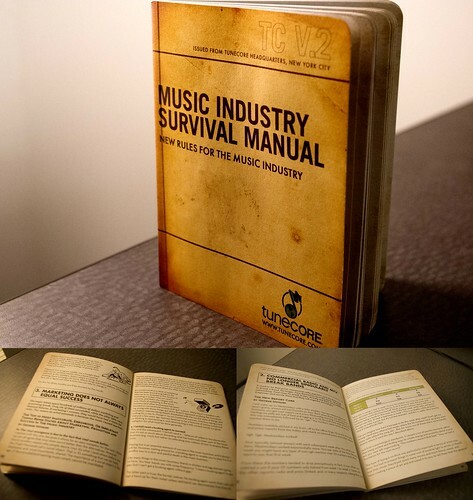 In fact, Tunecore partnered with Jakprints a few years ago to create a 70 page booklet called “Music Industry Survival Manual – New Rules For The Music Industry” that we’ve helped distribute at events like SXSW. Head on over to the New York Times site to read an extensive profile of Jeff Price and TuneCore. One of the new features here at the Jakprints blog is the monthly wrap up. We understand that you get busy and you may not have the time to hang on every word we type, so here’s a recap of all the awesomeness you may have missed in a tidy package just for you. One of our favorite posts of the month featured a handful of very talented and accomplished graphic designers sharing their two cents about the current state of typography. Click here to read what Jeff Finley, OKPants, Brian Jasinski and Ted Barnes had to say. We started the month off with a feature about John G and Jake Kelley’s new Cleveland based horror comic The Lake Erie Monster. We were there for their release party at Blue Arrow Records. Check out the video we put together highlighting the creation and release of The Lake Erie Monster and see the original blog post with pics from the event here. Design trends almost always inevitably wind up looking dated. Drop shadows, bevels, distressed text, and hand drawn fonts, all look great at first. Then it’s everywhere, it gets boring, and in time, it looks corny or passé. But honestly, even after it feels like they’ve jumped the shark, we still can’t get enough of the fan created Minimalist Movie Posters that seem to be everywhere. Some are cliché, but many are inspired, and we love seeing how elements of the films represented are used by the designer to define the tone of the piece. Here are some of our favorites. The Animal Builder is a colorful, inquisitive book about a giant anteater who creates animals out of things he finds in nature. It’s a book to open the imagination. Illustrated entirely in cut paper, it took author Kate Schruth two years to complete. And when she was done, she called on Jakprints to handle production. Kate decided to go with a gloss paper, a 16 pt. Card Stock cover and 12 pt. Card Stock for the interior pages to give it a children’s book feel. The full-color 32 page book was printed, collated and perfect bound at Jakprints and is 10.25″ x 10.25″. See the video below for a behind the scenes look at the creation of her illustrations, the production of her book and an audio interview with the author. The Animal Builder is now available on Amazon for purchase. Kate Schruth and Jakprints build The Animal Builder. For even more info, visit Kate’s website and check out this feature in The Greenwich Post. It seems that everywhere you look, whether online or in the real world, interest in typography is growing. From the influx of infographics on blogs, to the record-breaking usage of Pinterest; more and more, our attention is drawn to type. We asked a handful of very talented graphic designers to share their thoughts on the current state of text and titles. Artist, designer and partner at Go Media. Author of Thread’s Not Dead and founder of WMC Fest. Favorite Typography Trends: Hand-lettered, Americana motifs are tickling my fancy these days, like Jon Contino and Dan Cassaro. Scripty stuff, like, Dana Tanamachi’s chalk lettering is fantastic. These styles don’t need to be hand-lettered, but it provides an earthy, humanistic touch when they are. I’m also a huge fan of Niel Kellerhouse’s hand-lettered scrawl on his House of the Devil film posters. Although, the font he created for the new Dragon Tattoo series is amazing. AJ Dimarucot has really come a long way over the years with his aggressive, hand-lettered, modern calligraphy. Cleveland artists, John G and Jake Kelly celebrated the release of their new horror comic The Lake Erie Monster this past Saturday at Blue Arrow Records in Cleveland’s Waterloo Arts District. Both artists were on hand at the release party to distribute the comic, along with posters, stickers and buttons. The idea behind The Lake Erie Monster spawned from a series of 70s era fictional movie posters that the two worked on previously and decided to bring to life with a full narrative. The story certainly does come alive on the page. The vibrant 36 page, full-color book features two gruesome stories and a handful of illustrated ads that capture the spirit of the old-school horror comic. A number of the Jakprints crew were there at the release party, where we mingled with other local art enthusiasts, had punch and snacks, browsed through some choice vinyl and picked up our copies of the debut issue, all while listening to WCSB’s John Neely spin Cleveland/Ohio punk tunes. Jakprints is proud to be a sponsor of this new endeavor and we can’t wait until the next issue arrives. See below for some photos from the event and an exclusive behind the scenes video of the conception and production of The Lake Erie Monster. The Lake Erie Monster – A Cleveland Horror Comic from Jakprints, Inc on Vimeo. It was only a month ago that we featured BBP Partners’ fantastic New Years Cards. While we usually shy away from spotlighting the same customer so quickly, their Valentine’s Day promo really set our hearts aflutter. Designer Dede Vitrano thought of every meticulous detail for these mailers: custom-printed pillow envelopes to hold a die-cut greeting card, custom M&M’s, branded Favicards and all padded with some colorful confetti. She also created mailing labels that utilized our variable data addressing capabilities. She really did think of it all.